1900’s-1920’s (Edwardian Period): A frock coat (a double breasted long coat) was widely worn as part of men’s formalwear during the Edwardian and Victorian periods. By 1910, 3 piece suits became more popular than frock coats, but the slim fitted jackets and trousers were still worn. How to make it work: Nothing better than a slim fit 3 piece suit like the one above to recreate the period. 1920’s: Tail coat, top hat, bow tie and patent leather shoes were must haves in any men’s wardrobe during the Roaring Twenties. Daytime events required less formal attire, such as the sack suit (which consisted of jacket and slacks in matching fabrics), worn with colored shirts and silk ties in small geometric patterns. Wing tip shoes were also very popular at the time (commonly in white/tan or white/black). Informal men’s clothing of this time consisted of baggy pants (called Oxford pants), pullover sweaters and soft caps or fedora hats (which actually dates back from 1882, but only became popular in the 20’s). 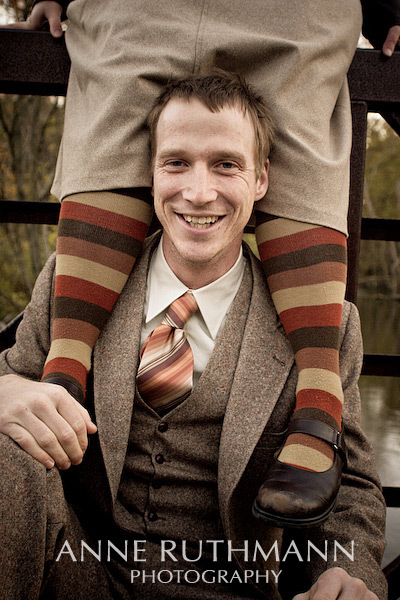 Tweed and flannel were the most popular fabrics used in men’s clothing during this decade. How to make it work: what about a trendy slim fit tweed suit like this one? Check out thrift stores and flea markets for tweed suits. Is worth it investing in a good tailor when the quality of the fabric is good (and when you get it at a great price). 1930’s: The old tradition from the 1900’s of wearing multiple outfits throughout the day had come to an end with the 1929 Wall Street Crash. People had little or no money to spend on clothing, and often times men would wear their old suits for their weddings. Double breasted suits became popular during 1930’s, which was also adopted by gangsters at that time. Gangsters often wore bold color shirts, wide stripe suits and bright plaids, making 1930’s fashion their own. How to make it work: a classic tuxedo will never go out of style, but if your groom is feeling courageous, what about a double breasted suit and wing tip shoes for a gangster look? 1940’s: The beginning of this decade started with strict rationing due to WWII. There weren’t natural fibers available to make clothing other than soldier uniforms, and men’s clothing lost their vests, pocket flaps and trouser cuffs. Grooms often wore their uniforms to their weddings. Formal evening wear was a privilege of the upper class and very few could afford to buy tuxes. Hand painted silk ties became popular at this time. How to make it work: if your fiance is in the Armed Forces, he can skip the tux and wear his own uniform. Next week I’ll be sharing groom styles from the 50’s, 60’s and 70’s, so check back for more! I am curious about the first vintage suit listed on your website as Eduardian period (Bottega Veneta). I am wondering if you could give me the location information for that picture, so that I might order the suit. Thanks for your help! This blog-post may not be as up-to-date now, but that still doesn’t keep me from attempting to at least try to get response from you. I was REALLY struck by the contemporary design of the first picture, as contrasted against the other. I’ve been looking just about everywhere for anything that comes close to matching the design of that 3-piece ensamble you reference. I love the vest, with the slits, producing a nice outline at the waistline. Any idea from what show this picture was taken and what the designer of this particular clothing is? Been looking everywhere for that design, but haven’t found it as yet. Would very much appreciate it and be grateful if you could get back to me with a reponse. I’m a fashion student and I was wondering what catwalk show the D&G suit is from? I cant find it anywhere!